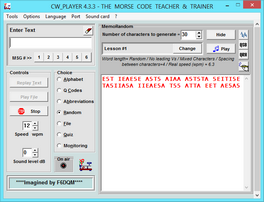 For those interested in learning the Morse Code (CW), there are many software solutions available to assist you, whether you are learning as an individual or as part of a tutored group. The group method has the advantage of learning with fellow amateurs, with the inevitable discussion and the introduction of a slight competitiveness. Your tutor will know if you’ve been practising sufficiently, as will your fellow students. As you progress your learning and are looking to go on-air, you have your fellow students to enjoy a QSO with for your first CW transmissions. Software programs for learning CW are many and varied and an Internet search will offer lots of programs to download. Here are just two suggestions for receiving practice that may be worth a try. By necessity, this overview of these two programs is rather short. Worthwhile doing your own research too. Both are essentially designed for code receiving practice at various speeds, pitch, character spacing, etc. and a whole lot more besides. One is for MS-Windows platform and the other for Google Android. Both programs require writing down of the received characters, although there is a quiz requiring keyboard entry on the Windows software. Learning to write quickly and legibly is another skill to be gained along the way. MS-Windows software first. The suggestion is to download the latest version of CW_Player, a freeware program written by Gabriel F6DQM. CW_Player is very intuitive, has a great interface and also extensive help files. As a complete beginner, the recommendation is not to start learning at anything slower than 12wpm, but with the character spacing increased to suit you. A spacing of 4 will bring the overall speed down to 6.3 wpm, but the characters will still be at 12wpm. This gives you CW with an understandable rhythm along with plenty of thinking time. As you progress reduce the character spacing. Over time, gradually increase speed to 15wpm, aiming for 15wpm with correct character spacing as an on-air goal. If you’re in a group your tutor can advise character groups, but I would advise setting CW Player Word Options to Random Length (2-8) which means that you learn word spacing right from the start. E5T IEAE5E A5T5 AIAA A5T5TA 5EITI5E effectively 6 words. This way, with the random groups, words gaps are recognised and learned at the same time as the characters. Much better than groups of 5 random characters all the time. For a free download CW_Player is excellent and well worth a try. It has many options to assist your learning. The help files include a ‘How to Learn’ section at the bottom. The second approach is to use an ‘App’ for Smartphones / Tablets that use the Android platform. The App is called CW Trainer. 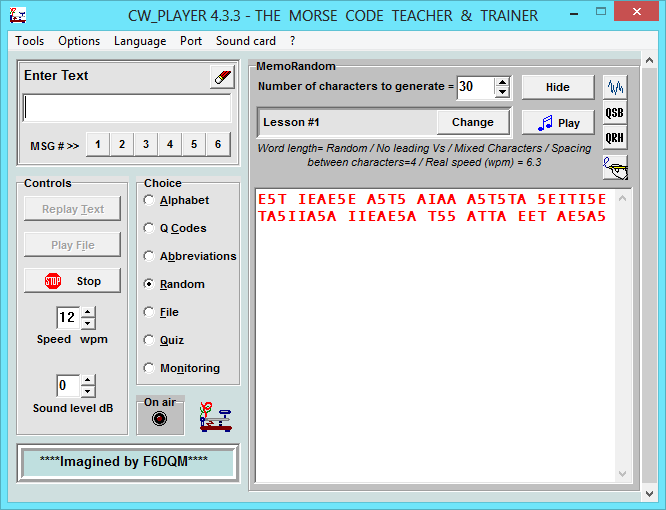 (not be confused with an App called Morse Code Trainer). CW Trainer for Android needs to be accessed from your Android device in order to download. This is a great App that costs less than £2 to download and can be used ‘on the go’ if you have a suitable device. If not, then perhaps the purchase of a small tablet could be considered. 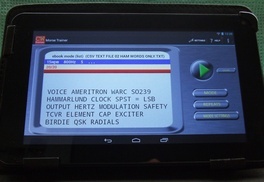 Prices have fallen sharply, less than £40 for example for an Archos Cobalt 7-inch tablet which handles the App nicely and can become a dedicated Morse Code training device if that is your preference. It’s not an iPad, and maybe somewhat slow, but does the required job very well. Again the software is very intuitive in use, offering additional features that even the excellent CW_Player does not have. 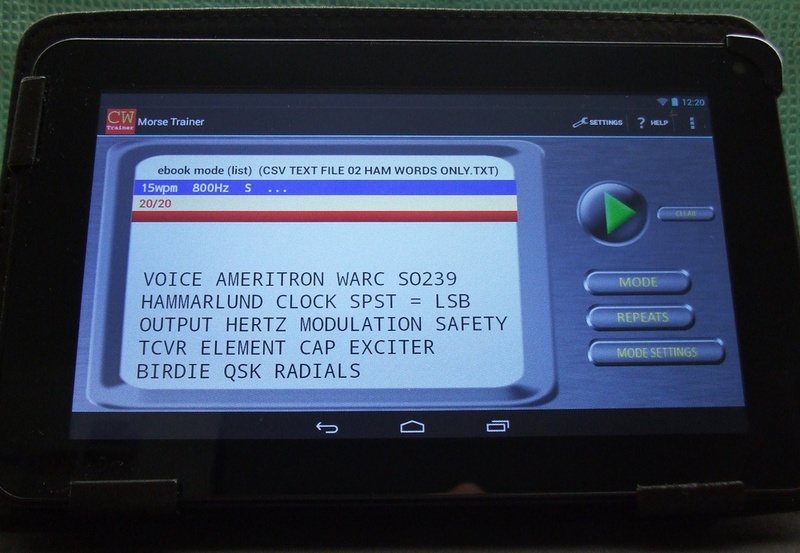 Besides the normal random character modes, this App contains databases of over 300 QSO texts, 5000 callsigns and 500 common words, all available to play randomly. Additionally you can create your own comma-separated files on your PC and download via an SD Card into the tablet, which again the App can play randomly at your desired settings via its Ebook mode - see photo. Both programs can be used as part of your learning scenario, in order to support your goal of becoming a CW operator.